During the 1890's both Canada and the U.S. would release three sets of stamps containing stamps with extremely high face values. The United States released the Columbian Exposition Issue in 1893 to correspond with the 400th Anniversary of the discovery of America by Christopher Columbus, and in 1898 the Trans-Mississippi Issue was released. Both sets contained stamps that were over $1 in face value. To get an idea of how much money that was, consider that in 1893, one pound of tea cost 75 cents. Today 100 grams of tea is $5 or more so a pound would be almost $25. It was a lot for a stamp, so much so that very few of these high values were printed and even fewer were saved. All the stamps pictured above, except for the $2, $3 and $5 are actual stamps that I have available for sale in my stock. The rest are images that I took from the public domain. The designs consisted of the Alfred Chalon portrait of the your Queen Victoria and the Alexander Bassano portrait of the old Queen side by side. The Queen's crown appears at the top and underneath the Queen's monogram VIR and the royal sceptre. The corners are adorned with ornate scrollwork. The stamps were designed by Lyndwode Charles Pereira and Peleg Franklin Brownell. The American Bank Note Company were the printers, and they printed the values up to and including the 8c in panes of 100 and the other values in panes of 50. As an interesting aside, when these stamps were sold, in order to avoid a large number of incomplete sets, customers of the post office who wanted to buy the scarce values like the 6c, 8c, 1/2c and so on were required to purchase quantities of the low values as well. So in a sense the sales of the scarcer stamps were artificially restricted. For this reason, these stamps were not popular with collectors when they first appeared and as recently as the 1930's the dollar values could still be purchased for face value. When I was growing up, the standard and specialized stamp catalogues presented this as a simple set of 16 stamps, with no varieties or points of interest to pursue. However, nothing could be further from the truth. The printing numbers are just large enough to produce some subtle and striking shade varieties, plate flaws and re-entries, but are not so numerous as to produce an unmanageble amount of variety. Indeed if you are looking for a challenging area in which to specialize, this issue is an excellent choice. The progression of values in the set allows you to form a collection with some rare stamps, but at the same time you can pursue sideline collections in the cheaper low values and occupy your interest while you wait for the better values to become available. Fortunately there are no perforation or significant paper varieties to worry about with this set. I will now briefly discuss each of these. Despite low printing numbers on the dollar values, pretty well every stamp in this set can be found with some collectible shade varieties. Sometimes they are just subtle variations in ink density, but in other cases, they are striking differences in the colour. There may be others, but that is a fairly large number of shades, without going overboard. You could do worse as a specialist than to aim for a mint and a used example of each of the above shades. Or if you really want the shade differences to "pop", try finding them in mint blocks of 4 - I guarantee you that you will spend a lifetime trying to do that. The die proofs as far as I know do exist for all the values in the set. My understanding is that they exist in both black, which are extremely rare and in the issued colours, which are also very rare. They do not, as far as I know exist in trial colours. It would seem that the post office department chose the colours once and stuck by their decision. However, plate proofs do exist for all values and they are readily available since the American Bank Note Company Archives sale that was held by Christie's in 1990. At this auction, some 300 sets of proofs containing all the values were made available. They are found in the same colours as the issued stamps, and I have noticed that many of the shade varieties that can be found on the issued stamps can also be found on the proofs as well. The postal rate for drop letters and postcards was 1c, and for letters was 3c, while registration was 5c. Thus the 1c, 3c and 5c values can generally be readily found on cover. Advertising covers were still popular during this period, so you can form a nice collection of 1c and 3c covers without breaking the bank. Many of the other values are much harder to find on cover. 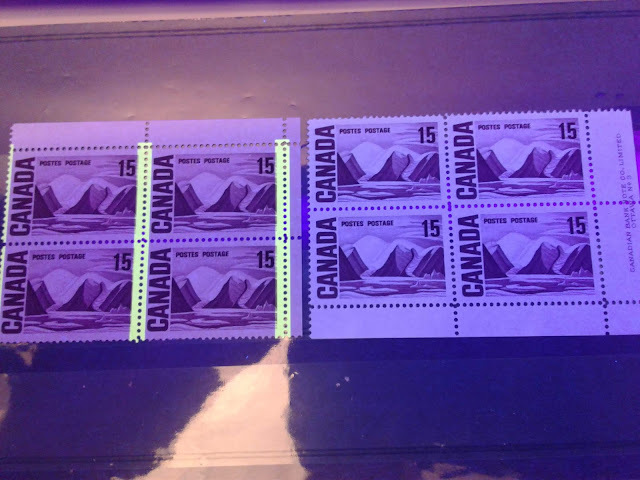 The 6c, 8c, 10c, and 15c can be found on foreign registered covers, but the other values except the 1/2c were generally only used for bulk mailings, and so they are found on bulk mailing tags or mailing receipts. Occasionally, one can find philatelic covers where the individual stamps were used, but not that often. Another challenging pursuit would be to find first day covers that were not intended as such, i.e. covers that just happened to be used on June 19, 1897. As you can see, the roller cancel consists of a row of several bars with the town name and often the office number reading upwards in between the bars. 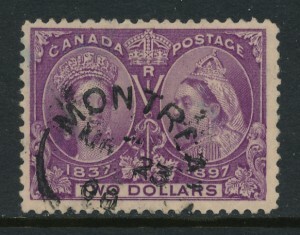 Both cancellation types were designed to completely deface the stamps to prevent re-use and were very effective at that. Generally speaking they have been less desirable to collectors over the years, although I believe that clearly struck and crisp rollers like the one above, that do not detract from the stamp's appearance are going to eventually become highly sought after as the study and collection of postal history continues to gather momentum. Used multiples of any kind are not common on this issue. Although auction realizations at the moment do not seem to reflect their scarcity, I believe that this is another growth area just waiting to be explored by a patient phuilatelist. The only listed plate flaw on this set occurs on the 20c and consists of a dash between the W and E of "Twenty". However, given that this variety was unknown 30 years ago, it is more than likely that there are other flaws that exist as well, particularly on the 1c, 2c and 3c, due to the number of plates used and the number of stamps printed. As stated in my post about Small Queens, a re-entry is a doubling of a portion of the design that occurs when the plates used to print the stamps are re-furbished by re-applying the transfer roll to those subjects on the plate that have worn. The doubling occurs because it is virtually impossible to re-apply the transfer roll in exact alignment with the older image. A misplaced entry occurs where the transfer roll is applied so far out of alignment that portions of the design can be seen in the wrong location on the stamps. If you look at the curved lines below the pearls and the bowed lines below those you can just see traces of red ink inside the while spaces. This is weak doubling of the lines and is a weak re-entry. Some of these are very subtle and require a lot of patience to see. You can still find large quantities of used 1c and 3c stamps for not a lot of money and could spend hours going through them looking for re-entries. Just a note of caution that due to the pale nature of the 1c ink that it may be difficult to see the re-entries on that value. The plate inscriptions for the sheets appeared in the upper margins once on each sheet, and generally 2-4 stamps are needed to see the full imprint. So full imprint pieces are scarce to rare, and are generally worth double what the corresponding number of singles would be worth. The number of plates used to print the 1c through 3c values would have been considerable, given the quantity of stamps printed. Most other values should have only one or at most three plates. So aiming to acquire plate pairs, strips or blocks for all values in this set is another pursuit that could require a small fortune and a lifetime of patience. 3. Hinge thins that are not noticed. Occasionally the dollar values are found in either lithographed or engraved forgeries. These are not too difficult to spot for someone who has some working experience with these stamps. The engraved forgeries, while good, just won't look right, while the lithographed product will lack the relief that the engraved stamps have. What can trip you up is that sometimes the forgeries have had fake roller or smudge cancels applied, and this can cause you to lower your guard. They still have some value mind you - just not as much as the issued stamps. Collectors have become increasingly fussy about centering. In fact perfectly centered examples of the dollar values regularly fetch over $1,000 each and if mint never hinged can sell for as much as $15,000 at auction. The stamps were line perforated and occasionally one comes across stamps from the outer margins of the sheet that have exceptionally wide margins on one side. These were historically frowned upon by collectors so much so that many unscrupulous fakers resorted to re-perforating and reducing these margins to recreate perfectly centered stamps. How do you check for this? First take a ruler and place it over the protected stamp in such a way that you join the perforation teeth on both sides of the stamp starting with the edge you are checking. Next take a protractor and check the angle that the ruler is at from the horizontal. Generally, in the case of properly perforated stamps, the angle will always be 90 degrees. If the stamp has been re-perforated, the perforations will not line up exactly with those on the opposite side and the angle will be off. Another way to check is to take another stamp and line it up with the perfs to see if the resulting holes formed by the two stamps are a perfect circle. Unless the perforating pins were bent, they should be, and re-perforated stamps will give holes that are either not smooth circles or are odd shapes. The paper on this issue is very soft and removing hinges is a very dangerous prospect because they will generally take some of the paper fires with them when you remove them. The resultant thins can be very hard to see and may often require watermark fluid. They do not make the stamps uncollectible - in fact I usually only lower the grade to the next lowest grade for a minor one. However, they do have an effect on the grade and if you are paying top dollar for the high values in VF condition, you should check them carefully for thins, especially if they are used. If you come across mint stamps with hinge remnants, my advice is to leave them alone. At least 50% of the time you will wind up damaging an otherwise fine or very fine stamp. Many of the values in the set catalogue more or less the same price used as mint. This means that often when dealers or collectors came across stuck down mint stamps or mint stamps with very bad gum or stains the solution was to soak them and apply either a forged cancellation or a genuine posthumous cancellation to the stamp. Generally this was done right in the corner, so high values with corner cancels should be viewed most of the time as unused stamps unless you can establish that the cancellation ink is contemporary for the period. It is hard to see the difference between these two scans, but the gum on the top stamp is creamy, smooth and has a satin-like sheen to it. In other words, it is not very shiny, but it is not dull or matte either. The gum on the second stamp has a semi-gloss sheen - moderately shiny, but not extremely so. In both cases, the gum has a creamy, very light coffee with cream tone to it. So if you see NH gum that is extremely crackly, extremely shiny, and colourless or very dark yellow, there is a good chance that you are looking at a re-gummed stamp, or at very least a stamp that has been sweated and had the gum redistributed to make it appear NH. To check for re-distribution, look for irregular crack patterns in the gum and brush marks. Whenever gum from this period gets wet and re-dries it the crack pattern will be different from the undisturbed gum. To check for re-gumming, look at the fibres that protrude from the perforation tips. First of all they should be there, as when these stamps are separated from their neighbours, there will be some fibres that do not separate cleanly. As I said earlier, this is a soft paper, so there should be more microfibres present than usual, and none of these should have any gum on the end, as the gumming was done before the stamps were perforated. If you see globules of gum on these fibres or the perforation tips then it means that either the stamp is re-gummed or has been sweated. A sweated stamp still has value as an OG stamp, as the gum is original, but it is treated as being heavily hinged. Whereas a blatant re-gum is treated as a stamp with no gum. If the gum has the same general characteristics and appearance as above, but is present on the perf. tips then it probably is original, but has been redistributed. Hopefully this has been a useful foray into this fascinating and popular issue. I welcome comments and additional information as always.